Short- and long-term variability has been observed for glucose and BP levels. Given the advances in medical technology, such as continuous glucose monitoring (CGM) and 24 h ambulatory blood pressure monitoring (ABPM), short-term glucose and BP variability can be detected in greater detail. Although long-term glucose variability has been associated with oxidative stress in patients with T2DM , cross-sectional and interventional studies have also found a correlation between short-term glucose variability and oxidative stress in patients with T2DM [15–17]. However, only a few reports have investigated the association between oxidative stress and BP variability in patients with T2DM and hypertension. 13098_2019_425_MOESM1_ESM.docx Additional file 1: Table S1. 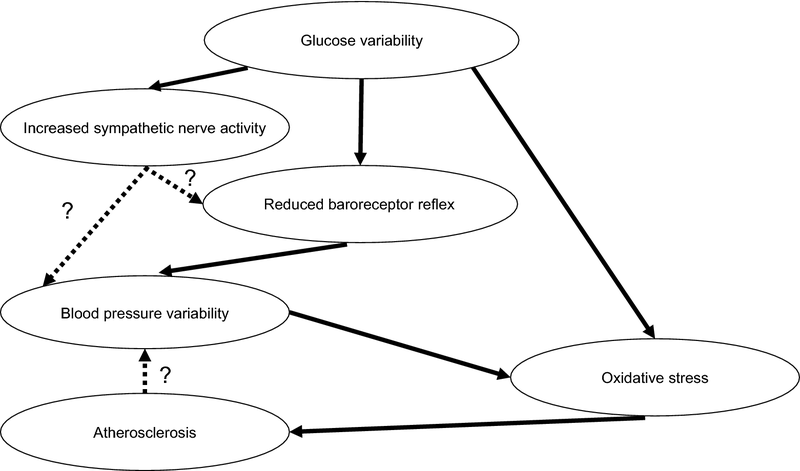 Relationship between glucose variability, nighttime blood pressure variability, glucose variability + nighttime blood pressure variability, and oxidative stress. 13098_2019_425_MOESM2_ESM.docx Additional file 2: Table S2. Correlations between MAGE and blood pressure variability. 13098_2019_425_MOESM3_ESM.docx Additional file 3. Correlations between LF/HF ratio and CVR–R, glucose variability, and markers of blood pressure control.